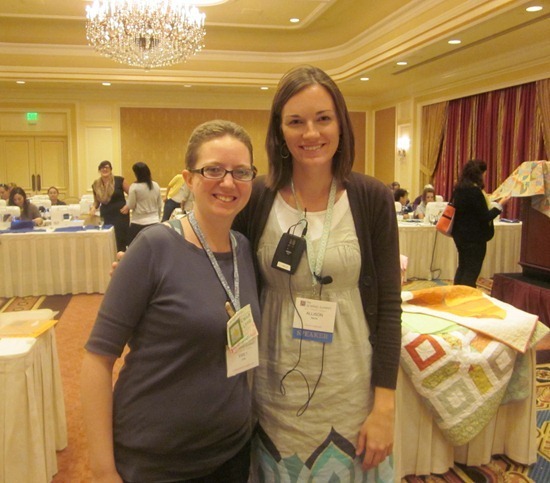 I had a great time at the Sewing Summit this past weekend. It was so fun to meet other people who love this stuff like I do. I was so bad though….I took NO pictures. Not one..zip..zero. None. My excuse is that my camera decided it’s had enough of me and doesn’t focus anymore…and so I need to buy a new one. I don’t have the heart to tell my husband how much $$$$ it is though…ouch they are expensive. Anyways…so these pictures are Emily’s (thank you Emily). I taught the class on free motion quilting…it was really fun. For some it was their first time trying to quilt…for others they were already good at it…so my only hope was that everybody left having tried something new and being more comfortable with it. I got good at quilting backwards standing up…this could come in handy someday. Alison, it was so nice to meet you and take your class on free motion quilting. I learned so much and am inspired to quilt more. I was also happy I guessed your due date and won some pretty great batting. Woot! Woot! I loved your class and it was so nice to meet you! Wow what a whirlwind of a weekend! Oh! They are soooo lucky! I wish I could attend a quilting class from you. Will you ever come to Spain? :) We don't have Walmart but we do have eager pupils!! Glad everyone had a good time, sounds like fun time to connnect and learn. It was nice to meet you, Allison! Allison, your class was great! Like you, I love the actual quilting part of making a quilt, and I loved trying some new FMQ patterns! It was great to meet you, thanks for an inspiring class! your class was great and really motivated me to try more free-motion quilting! thanks! no pictures mean that you were TOTALLY in the moment and having fun… I'll go with that. Quilting backwards standing up? Damn girl, you are talented! I wished I was there, since I've been sitting here looking at my basted Kaleidoscope quilt wondering how the heck to quilt it all weekend. A free-motion class is what I need right now! ha! here i thought i was shadowing you. good times. :) i took three photos with my iphone. your picture was one of them. but it's upside down on my blog…don't know why. FMQ backwards and standing up?!! That's a talent! Aww, don't you look adorable teaching! glad you had a great time, I am sure everyone was quite pleased! It was a great class, Allison. I feel that much more friendly with FMQ now, and am planning to spend some time with the half-used sandwich I brought home! Totally a pleasure meeting you. I'm most impressed by the free motion quilting backwards standing up part! My sister in law took your class, went home, and FMQ her first quilt. Pretty awesome, I say!!! Nice to see you again. 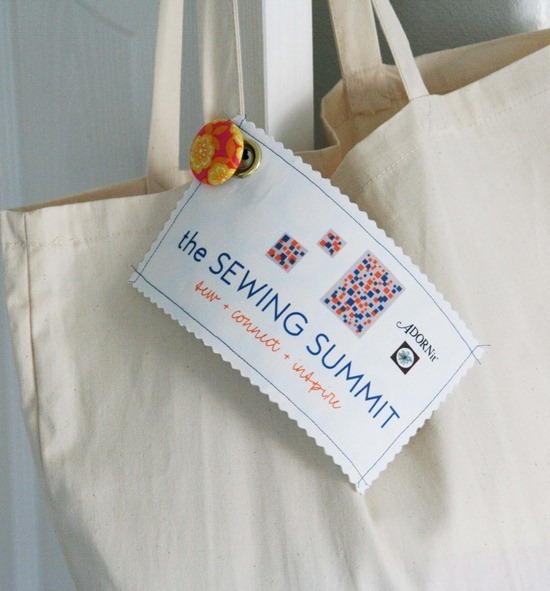 I love reading about the Sewing Summit! I am excited to cultivate my online relationships with other quilters and seamstress' over the next year to prepare!